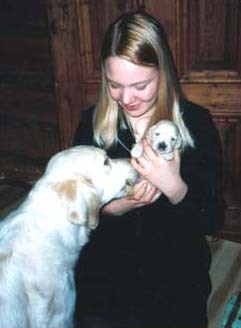 In 1995 I spent my summer holiday taking care of dogs at kennel Karvin in Kangasala. Immediately after arriving to family Karves I got to know and fell in love with a puppy, which had just arrived from Sweden. The puppy was called "Fiffi", officially Festival's Five Five. Right from the beginning, "Fiffi" was brave and vigorous, and her tale wagged a lot. 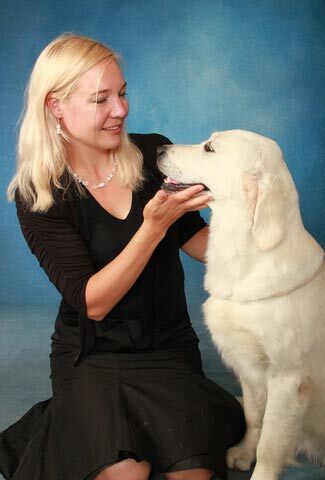 In addition, she was very elegant, just as a dog that I wanted for myself. I followed "Fiffis" growth and development and she grew to be a very fine individual. Her temperament proved to be as expected for her breed and she was qualified in the field on the first go already when she was 8 months old. 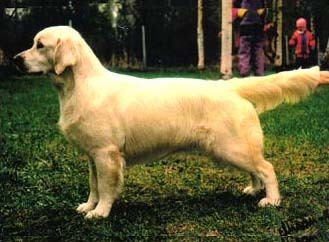 "Fiffi" got excellent points also in the breed club (Golden Ring) character test. As Fiffi was only 5 months she took part in her really first dog show and won the title of BIS-1 puppy! When she was 11 months old, we went to the Tallin International show where Paula Heikkinen-Lehkonen rewarded Fiffi with a certificate and BOB. Not long after that Fiffi won 3 more certificates in Finland and became the new FIN & EST Champion. In summer 1997 I worked in Northern Irland at Kate and Jim Crosbie (kennel Garbank-Lislone), taking care of and showing their dogs at dog shows. When I returned to Finland I took a puppy with me Garbank Lislone Katrina. At Christmas 1997 "Fiffi" had her first litter with Gunhills Dalbury. 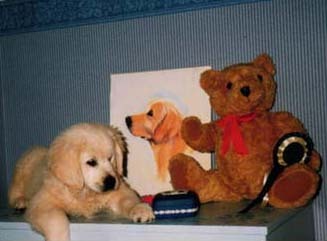 From this litter "Fiffis" owner, Heidi Karves, chose me one puppy, which I named "Manda" Karvin Rio Ramanda. "Manda" was also a vigorous and brave puppy. Her outgoing temperament became very clear already as a puppy and following her mother's footsteps she was qualified in the field already when she was 8 months old. (Ch Karvin Rio Ramanda - Gleaming Big Love).